Well, it’s probably been a gut-check for investors, but the stock market’s gyrations have given swing traders plenty of action. Amid a whirlwind of catalysts—Brexit drama, plunging oil prices, and continued tech weakness—US stocks spent the first part of last week in retreat before standing their ground on Thursday and Friday. 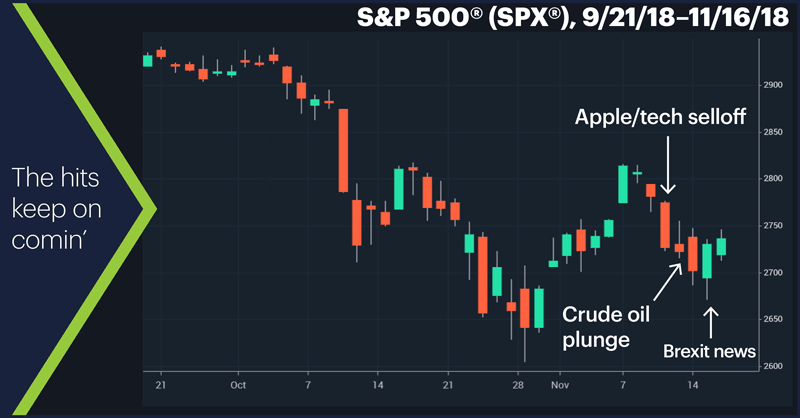 After a tech-driven Monday selloff spearheaded by a slumping Apple (AAPL), Tuesday’s intraday rebound got kicked in the shins by an epic crude oil dump: January WTI crude oil futures (CLF9) fell 7% intraday (after losing more than 4% on Monday), understandably spooking stocks, which turned lower and closed down on the day. But after dropping to an 11-day low on Thursday morning—amid global stock weakness on news of the latest wrench tossed into the Brexit works—the S&P 500 (SPX) charged higher to close in the green, and followed through with a gain on Friday, which included some optimistic chatter regarding the US-China trade war.1 In the end, although it turned out to be a down week, the SPX managed to keep its head above the waterline of its late-October lows. 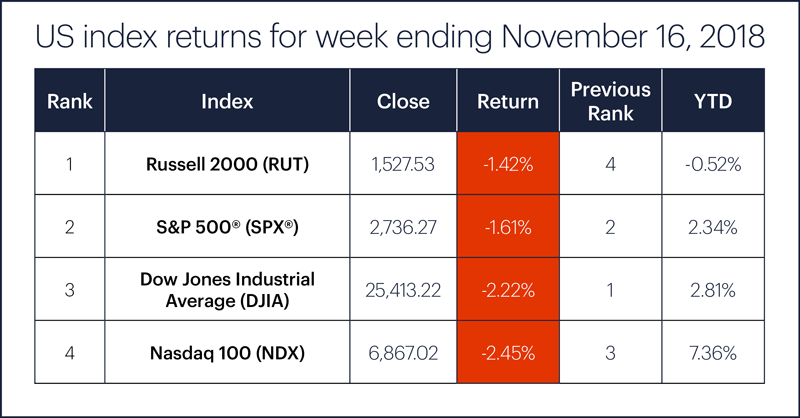 Sector action: And the crowd chants, “De-fense, de-fense…” During an overall red week, things got a little defensive: real estate (+0.8%), materials (+0.4%), and utilities (-0.3%) were the top-performing S&P 500 sectors, while consumer discretionary (-3.8%), information technology (-2.5%), and energy (-2.1%) were the weakest. Highlight reel: Apple (AAPL) had one of its worst weeks in a while, falling 5% on Monday, 1% on Tuesday, and 3% on Wednesday before finding its footing on Thursday. Abiomed (ABMD), which has been choppier than a Veg-O-Matic since June, dropped nearly 17% on Monday, and kept sliding until Thursday. Utility provider PG&E (PCG), which dropped 63% from November 8-15 as the California wildfires continued to wreak havoc, rebounded 38% on Friday. Futures watch: After its Tuesday tank job, January WTI crude oil futures (CLF9) put together tentative gains on Wednesday, Thursday, and Friday, although in each case the market pulled back significantly from intraday highs. Crude ended the week around $57/barrel. Thursday’s Brexit woes dinged December British pound futures (6EZ8), which dropped 2% to test (again) support around 1.2750. On Monday December Dollar Index futures (DXZ18) topped their August highs to reach their highest level (97.53) since June 2017 before pulling back the remainder of the week. Futures contracts expiring this week include December WTI Crude Oil (CLZ8) and November Mexican peso (6MX8) today, and December S&P 500 VIX (VXZ8) on Wednesday. 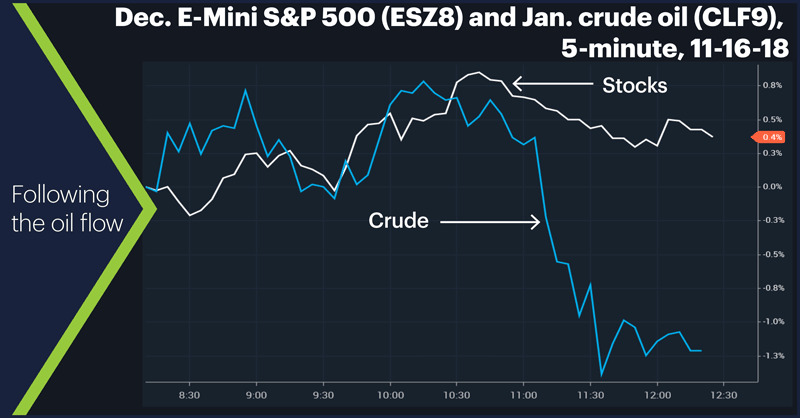 During this period, at least, the equity market (white line) followed the crude market’s (blue line) swings pretty faithfully, in direction if not magnitude. 1 Trump Says He’s Optimistic About Trade Deal After Receiving China Response. 11/16/18.